When we think Vivitar, the first thing that comes to mind are the point and shoot cameras that we all know and love. Like many other successful tech companies, they have evolved. And in a really great way. 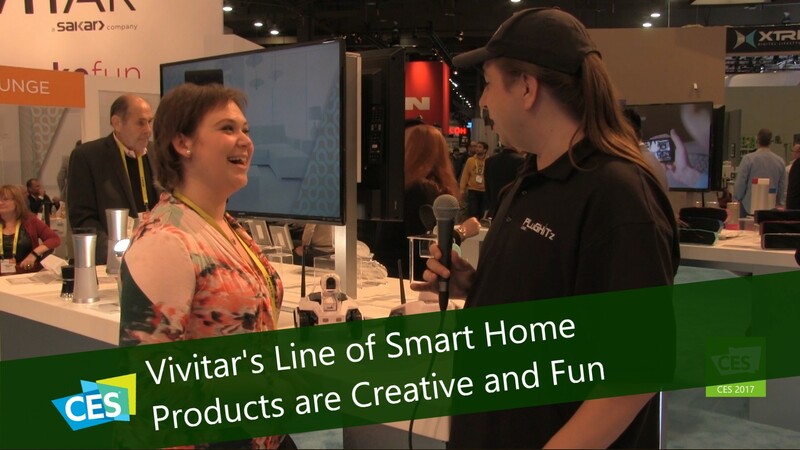 This year at CES they have unveiled fun new additions to their line of smart home products. First up is their hero product, the Vivi Voice Assistant which works in conjunction with all of their other smart home products. This speaker has a sleek, metallic design that will fit into virtually any décor. It features Amazon Alexa technology and offers 360 degree sound with a rich bass. And it’s priced to compete with the Echo at $99. They have also added smart home security cameras to the mix. And we have to say, they are quite clever. All offer Wi-Fi and are controllable from both iOS and Android. There is a ceiling/wall mounted 360 degree camera that is uniquely designed to look like a smoke detector that will retail for approx. $149.99. Also doorbell cameras that offers night vision and the ability to speak directly through the unit that will also retail for approx. $149.99. A less conspicuous model is the new IP Camera that come in a fun rain drop shape and cool colors that offer live video streaming so you can monitor any room of the house anytime. These will retail for approx. $99. Last but not least, there’s our personal favorite here at PLuGHiTz Live: The RoboCams. There are two models that again are controlled via iOS and Android devices which act as rover cams. The higher end model offers a telescoping camera with an articulating eye. Pricing is expected to start at $200. We love how this new camera line intertwines practicality and just plain fun. These products are expected to be available in Q2 and you’ll be able to check them all out on their website. Interview by Scott Ertz of F5 Live: Refreshing Technology for the Tech Podcast Network. Blast to the future with the Monster Blaster: the boombox reimagined. Meet the Microsoft Surface family, the most productive devices on the planet.